How do you block spam traffic from visiting your site? Discussion in 'Black Hat SEO Tools' started by miedy, Sep 25, 2014. Recently, I have been noticing numerous amount of visitors from random pages on my blog. Checking the traffic it was purely spam traffic 90% bounce rate which will hurt my rankings. And they would only stay for 10 seconds. 90% from homepage which is empty page. 90% from homepage which is empty page. Maybe its not spam and they bounce because your homepage is empty? Wordpress got you plug-in for blocking spam/bot traffic, try it! which plugin? I have been using wordfence but no luck! I have constantly blocking ips and they would still arrive..
Upload statpress plugin or check ip's in your stats in your cpanel and you will see which ip's you want to keep and which ip's you would like to block.I think wordpress has a setting in the panel where you can block certain ip's. Easy way,find the ip you would like to block and block the range of ip's in your hosting account.Likely it is bot traffic. What you are seeing is is not spam traffic. It is data miners/collectors/aggregators. Blocking them is nearly hopeless because they have so many IP addresses available and they use varying user agents. If you can find the IP ranges that they use, you can block by range just as you wold a country. The con side is that you may slow the site down. 2) Project honeypot sets up some traps for bots and spam traffic. Good example - hidden link on homepage pointing to /admin/. Robots.txt says NOBODY goes to /admin/. Bot is super curious and goes to admin. 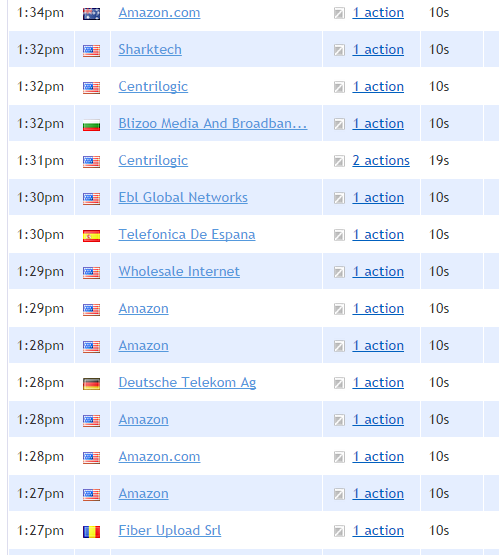 3) Bot IP is collected and banned (firewall rules I believe). Not only that, but the IP address of the bad visitor is sent to the cloud blacklist along with what they did. 1) Each visitor gets a unique email generated on the page. Example: [email protected]. Each visitor IP is logged to that email address. If an email is ever directed to [email protected] - that IP is blacklisted. They harvested your email address and tried to send to it. 2) Since your honeypot is syncing with the cloud, that IP is not blacklisted on every site signed up with project honeypot. 1) Robots enforcement - Specifically list juicy directores (eg /admin/) in the robots.txt and forbid them to all robots. Have any visitor to /admin/ automatically banned (firewall/IPTables) for say 1 day. 2) Hidden links - make links people can't see. Only bots will pick them up. Same solution as above. This would also be effective with mass downloaders of your website. I wouldn't extend the ban for very long (i.e. lifetime) for a couple reasons. First is to keep the banned list of IP's small. Second is to ensure you still get legit visitors. IP's change all the time. Be flexible. I'm sure there are other ideas you can develop. This should get you started. Were you able to solve this issue? We've been having exactly the same problem for over 7 months and still cannot find a solution. It's not GA referral spam problem, it's something else that is creating a ton of "direct" traffic (unreasonable) to our website's homepage with extremely high bounce rate. We have clicky too and what we see is exactly the same you had in your screenshot. We tried project honeypot too but the IPs (thousands, and all different, mainly from the US)don't seem to be in their database. We suddenly began having this problem from one day to another and cannot find the source or solution. We know for sure that the traffic is not real, we are in a very small niche market. Any help or advise from you guys will be appreciated.